14 NOV – A proposito dell’annuncio di Trump di voler cacciare almeno tre milioni di immigrati irregolari il card. Montenegro osserva: “Ma li metterà tutti in fila e li conterà uno per uno? Per le leggi fisiche se io sposto una realtà da una parte all’altra questa realtà deve sboccare altrove e il problema non lo risolvo ma lo tampono solamente. O si dovrà svuotare l’America di milioni di irregolari? Mi sembra strano come con tanta facilità si costruisca un muro di migliaia di chilometri, come un’altra muraglia cinese, ma questa meno artistica”. “L’Europa sta rischiando – conclude -. L’immigrazione ci ha obbligato a guardarci in faccia e ci ha messo con le spalle al muro. Dovremo fare delle scelte sulle quali si leggerà quale il futuro come società e come Chiesa”. ..Innanzitutto il muro tra gli Stati Uniti e il Messico non è stato costruito dai repubblicani, ma da Bill Clinton nel 1994. In secondo luogo, nemmeno Obama premio Nobel per la Pace è mai stato tanto tenero con i clandestini. “Gli Stati Uniti – spiega Franzen sulla Stampa – attualmente deportano tra i 300 e i 400mila clandestini ogni anno, la presidenza Obama è stata una delle più severe in questo senso con oltre 2,5 milioni di deportati dal 2009 al 2015. Al netto di coloro che sono stati fermati al confine. Quindi i meccanismi sono già oliati da un punto di vista tecnico” . IT IS the drowsy after-lunch slot in one of San Antonio’s immigration courts, housed anonymously on the third floor of a squat brown office building, when the case of Pedro Rochas begins. Most of the men who appear before immigration courts tend to favour hardly worn suits with matching shoes, as if going to church. Mr Rochas, a slight 33-year-old, is dressed less smartly in jeans and a red sweatshirt. He came to America at 16 and works as a part-time cook in a retirement home in Cedar Park, a town on the outskirts of Austin, where he met his wife. They have three children, all born in America. The offence that placed Mr Rochas in court on a cold day just before Thanksgiving was the purchase of a Social Security card, which allowed him to get work. He will probably be deported for it. Last year America removed 369,000 undocumented migrants, an increase of nine times compared with 20 years ago (see chart 1). This takes the total number of the deported to almost 2m in Barack Obama’s presidency. While this has been going on, the number of people entering America illegally via the south-western border has dropped. There are no official numbers on how many people become illegal immigrants by overstaying their visas. But the data that are collected, combined with estimates to fill the gaps, suggest that in the past couple of years, for the first time since people started to talk about illegal migration, the outflow has been greater than the inflow. On one measure this is a great success. It is hard to find many areas where the federal government is so effective in implementing laws passed by Congress. Yet it is harmful—not just for the deported, who often have a miserable time once they are expelled (see article), but for the country they leave behind, something which even the deporters have come to recognise. How has a president who campaigned hard on migration reform come to preside over the expulsion of more migrants than ever? The government has long had the authority to expel undocumented migrants, but deporting them all is impractical (there are reckoned to be 11.7m). It has therefore chosen to concentrate on getting rid of criminals. This category is more elastic than it might seem. It was expanded in 1996, when a Republican-controlled Congress passed a tough immigration law and illegal border crossings were running at four times their current level. That law reclassified several misdemeanours as “aggravated felonies” if they were committed by an illegal immigrant, lowering the legal barriers to deportation. The expanded list included stumbles that undocumented migrants are quite likely to make, such as failing to appear in court or having fake papers. It also removed time limits on these offences, so that crimes committed by teenagers could lead to deportation 20 years later. One government lawyer in San Antonio says that some of the cases he argues stretch back decades. “You can be in your 40s or 50s and have a marijuana conviction from 20 years ago and be deported for it,” explains Doris Meissner of the non-partisan Migration Policy Institute. The effects of this change in the law were limited at first. The year after it passed 115,000 people were deported. This is because the means to enforce it were not available. That changed after the September 11th 2001 terrorist attacks when, by an odd jump of logic, a mass murder committed by mostly Saudi terrorists resulted in an almost limitless amount of money being made available for the deportation of Mexican house-painters. 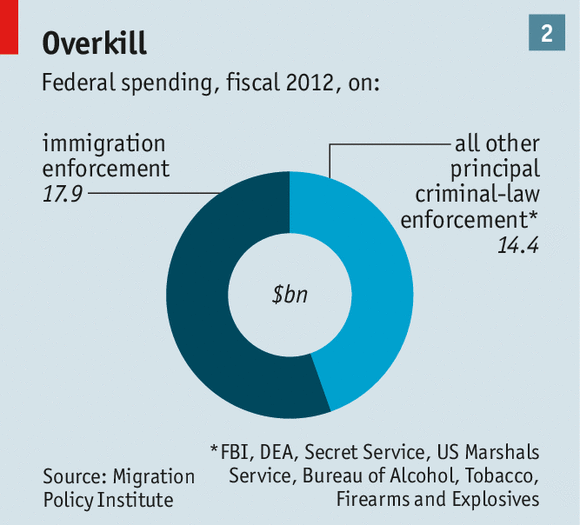 America now spends more money on immigration enforcement than on all the other main federal law-enforcement agencies combined (see chart 2). Much of that spending has created a border agency that can operate throughout the country. Before the September 11th 2001 attacks it was considered a threat to liberty for agencies to share too much information. After the report of the 9/11 Commission the opposite became true. The result is that Immigration and Customs Enforcement (ICE), the agency charged with doing the deporting, can now quickly determine whether someone serving a prison sentence for a serious crime is eligible to be deported when their time is up. More controversially, it also allows ICE to see whether someone charged by the police with relatively minor offences can also be deported. The turning of police officers into immigration officials has brought border enforcement into areas of the country far from the deserts of the south-west. Secure Communities, the name given to the programme that links police work to the immigration database, began life in a single jurisdiction in Texas in 2008 at the end of George W. Bush’s presidency. By May 2013 it was operating everywhere. This worries some policemen. “I would sooner see Secure Communities go away,” says Mark Curran, an Illinois sheriff. He thinks that the programme makes policing harder because it erodes trust between his officers and the people they are supposed to police. Anecdotal evidence suggests that people are more likely to flee the scene of a car crash in places where there are lots of undocumented migrants to avoid being asked for their papers. Some people take more drastic steps to avoid triggering a match on the database. In November ICE arrested a doctor in Boston who flew in regularly from the Dominican Republic to alter fingerprints. A full set of unrecognisable fingertips cost $4,500. While the police have been tracking down migrants, the Department for Homeland Security has continued to raid workplaces and audit companies to see if they employ undocumented workers. In November Infosys, an Indian IT firm, agreed to pay fines of $34m for immigration offences. Farmers who need lots of pairs of hands to pick things are favourite targets for these checks. Maureen Torrey, a farmer in New York state, says her business has been subjected to aggressive raids by immigration officials. Last year officers turned up at 6.30am and removed 44 workers to check their status. They were eventually dropped off at a 7-Eleven store two hours from the farm. As the system for tracking people down has become more powerful, there has been a huge increase in the number of plaintiffs appearing before immigration courts. Some 1.1m people are somewhere on the docket: that is nearly 5,000 immigration cases per judge. 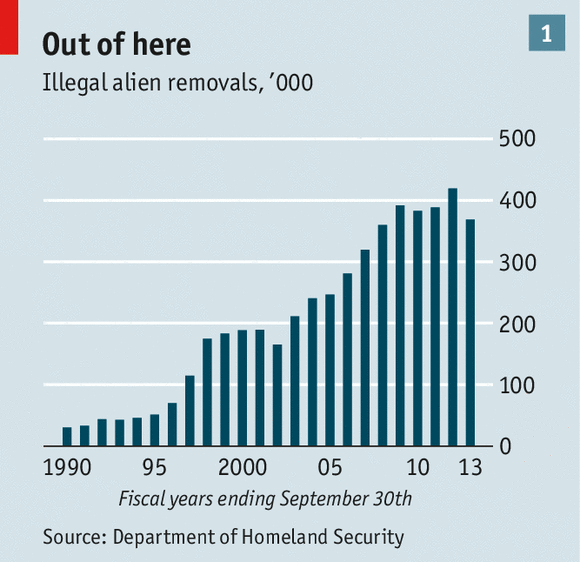 More than half of all federal prosecutions are now for immigration-related offences. To deal with this overload, courts have sprung up all over the place: close to the border, but also in Michigan, Minnesota, Missouri, Nebraska and New Jersey. They all have the same blue carpets, dark wood benches and American flags, identikit outposts of the Justice Department tucked away unannounced in office buildings. The system does a good job of giving each plaintiff a decent hearing. One typical day in the San Antonio court featured a Vietnamese woman, married to an American citizen, fighting deportation, a young couple hoping to get married soon, and a man who had a conviction for abandoning a child. The judges were patient and, working through interpreters, did their best to render legalese into plain English. This lent the process a certain dignity, but in most cases the outcome was clear from early on. The number of people deported is largely determined by the number of beds available in detention centres, which are the holding pens for the people America expels. Each year Congress mandates funding for a certain number of beds for immigration detention and stipulates that the occupancy rate must be kept high. In 2013 that number was 34,000. The president asks for less funding in his budgets but Congress gives him more, such is the political appeal of spending on border security. Some of these places are run by private companies for ICE, like the one in Pearsall, a small Texas town decorated with churches, car-parts shops and a high-school football field. The facility can house up to 1,800 men at any one time, sleeping on iron bunk-beds in dormitories of up to 100. This is not a prison but it has few windows, is surrounded by fences topped with razor wire and is run by the GEO Group, a company that also runs prisons. The Pearsall detention facility is quiet inside, apart from the noise of thick metal doors opening and closing. A manager explains that the colour scheme, mostly khaki, has been carefully chosen to keep the inmates calm. More people spend time in such places in any given year than serve time in federal prisons. Housing them all cost $2 billion in 2012, or nearly $5,000 per person deported. Even with all this funding, the beds the government is mandated to provide exceed the number of places available in detention facilities, so the excess are housed in ordinary prisons. In other words, they are locked up with ordinary felons. The requirement to keep the beds filled means that as soon as one group of people are deported another arrives to replace them. On the day your correspondent visited the Pearsall detention centre the occupancy rate had dipped to 95%, so the staff were expecting a new delivery of people. The average length of stay in these places before deportation is about a month. Multiply the number of beds by 12 and you get close to the number of people deported each year. In the Pearsall facility the men wear colour-coded boiler-suits: blue for minor offences, orange for mid-level ones and red for the most serious offenders. The government is keen to focus its efforts on serious criminals, the red boiler-suits, and boot them back over the border. But in the Pearsall detention centre there are a lot of people wearing blue. TRAC, a database maintained by Syracuse University of each case that comes before the courts, shows that just one in seven filings to deport is based on allegations of criminal activity. The government has to make sure that the countries where detainees were born will have them back. In rare cases this proves impossible. Families for Freedom, an NGO, says it is working with a Kenyan man who has been in immigration detention in New York for eight years. From the detention centres the deportees are rounded up and put on planes. ICE has its own air operations division which flew 44 charter flights a week in 2013, and runs a daily flight to deposit people in Central America. When flying to more unusual destinations, an ICE agent will babysit the deportee on a commercial flight. The great expulsion which America is carrying out is removing some people who have committed violent crimes. But it is also expelling economic migrants, some of whom have been working in America for decades, and splitting up families. In the two years to September 2012, 205,000 parents were deported. Judges do have the discretion to halt a deportation if it will cause extraordinary distress to the family. But in the case of Mr Rochas, the care-home worker, the distress of his wife and children, who face growing up without their father, was of the ordinary variety; and besides, the clemency quota had been filled already. C’e’ una direttiva del Congresso Usa, poco nota al pubblico, in base alla quale i funzionari del Dipartimento della sicurezza interna degli Stati Uniti hanno posto sotto detenzione un numero record di immigrati illegali. La direttiva, conosciuta nei circoli di Capitol Hill con l’appellativo di “bed mandate”, impone alla US Immigration and Customs Enforcement (Ice), l’agenzia che si occupa della sicurezza delle frontiere e delle dogane, di mantenere in custodia una media di 34mila detenuti al giorno. Una ‘quota’ che e’ costantemente cresciuta a partire dal 2006, quando venne istituita dai Repubblicani, convinti che l’agenzia non stesse facendo abbastanza per espellere dal Paese gli immigrati irregolari. Gli effetti paradossali di quella norma appaiono oggi in tutta la loro evidenza. Se l’immigrazione illegale dal Messico e’ scesa quasi ai livelli minimi dal 1970, l’Ice per raggiungere gli obiettivi fissati dal Congresso ha dovuto procedere a una vera e propria ‘caccia all’irregolare’ per trovare un numero sufficiente di stranieri da espellere. In alcuni casi si e’ trattato e si tratta di immigrati irregolari che non hanno commesso alcun reato, ma che semplicemente sono stati fermati dalla polizia stradale senza avere i documenti in ordine. In altri casi, di stranieri che risiedono legalmente negli Stati Uniti, ma che per aver commesso un reato, anche di natura minore, e avere anche scontanto l’eventuale pena in carcere, possono essere espulsi. Il Dipartimento della sicurezza interna nega di avere usato con troppa facilita’ le manette pur di raggiungere i numeri imposti dalla norma. Con circa 11 milioni di immigrati non in regola che vivono negli Stati Uniti, il Dipartimento e’ “pieno di clienti”, ha commentato il deputato del texas John Abney Culberson. Ma i critici del “bed mandate” sostengono che la maggior parte delle persone poste sotto la custodia dell’Ice sono responsabili di reati non violenti e che a molti di loro, una volta comparsi davanti a un giudice, e’ consentito di rimanere negli Stati Uniti. Mentre altri, rimangono per mesi in custodia, con un notevole spreco di risorse, perfino quando si potrebbe ricorrere ad alternative meno costose, come i braccialetti elettronici o altre forme di controllo elettronico. Poiche’ la spesa del governo federale per la detenzione e l’espulsione degli immigrati irregolari ha raggiunto la cifra record di 2,8 miliardi di dollari l’anno, piu’ del doppio rispetto all’introduzione della norma nel 2006, la direttiva comincia ad attirare le critiche non solo dei Democratici, ma anche di quei falchi Repubblicani favorevoli a drastici tagli al bilancio del governo federale. In particolare, dopo che il Dipartimento per la sicurezza interna ad aprile ha riferito al Congresso che si potrebbero risparmiare parecchi soldi abbassando la quota a 31.800 detenuti e adottando misure alternative alla detenzione. Immigrant-rights advocates and some Latino leaders are voicing concern at Senator Clinton’s campaign-trail rhetoric about swiftly deporting immigrants with a criminal past. Senator Clinton speaks yesterday during a news conference in Memphis, Tenn.
A vow to give the boot to criminal aliens has become an almost daily part of the New York senator’s presidential campaign spiel on overhauling the immigration system. Mrs. Clinton’s emphasis on the haste with which criminals would be removed may make voters more tolerant of her support for legalizing most illegal aliens, but for activists who aid people with immigration problems, her refrain about the lack of recourse is hard to stomach. In the public remarks reviewed by The New York Sun, Mrs. Clinton seemed to propose mandatory deportation for any crime. In several instances, she did not say explicitly whether she was referring to all foreigners in America or only to illegal aliens seeking to be legalized. However, she made the comments while outlining her position on the immigration overhaul which failed in Congress last year. The bill’s language permitted legalization for some who committed crimes relating to illegal entry into America and forging Social Security cards. Some Republicans tried to add those crimes to the list which could make one ineligible to stay, but supporters of the bill objected, saying such a bar would effectively scuttle the bill since most illegal migrants have violated those laws. Mrs. Clinton’s leading rival for the nomination, Senator Obama of Illinois, does not appear to address the criminal alien issue regularly on the stump. However, he supported the immigration bill and cast the same votes as the former first lady on the crime-related amendments. The other major Democratic presidential candidate, John Edwards, backs the bill, but was not in the Senate last year. Among the Republican hopefuls, Mr. McCain was the only backer of the immigration measure. One subtext to the concern is that immigrant-rights advocates are still angry with President Clinton over legislation he signed in 1996 that effectively stripped judges of the power to block the deportation of foreigners convicted of an “aggravated felony.” The term was broadly defined and has led to automatic deportations even for what some might consider minor offenses. “How about two public urinations? How about driving a car recklessly and your sister dies in the passenger seat and you get deported for that?” a law professor at the University of California at Davis, Bill Hing, said. He called Mrs. Clinton’s rhetoric overly simplistic. “She needs to make it a lot more clear rather than making these sweeping statements. It is dangerous to write off people without considering their individual backgrounds,” the professor said. While Mrs. Clinton’s campaign stressed that she was referring to illegal aliens who commit crimes, it did not reply to a query about whether she favors automatic deportation of legal immigrants who run afoul of the law. In 2001, Mr. Kennedy introduced a bill to overturn part of the 1996 legislation, signed by Mr. Clinton, which made deportation automatic in many cases. The measure never got out of committee, but it had ten Democratic co-sponsors in the Senate. Mrs. Clinton was not among them. The New York senator’s showcasing of the criminal alien issue dovetails with the tough stance her husband took on crime in his 1992 and 1996 campaigns. Last month, she broke ranks with her Democratic rivals by opposing plans to shorten the sentences of some convicted of dealing or possessing crack cocaine. NEW YORK – L’emergenza immigrazione ai confini tra Stati Uniti e Messico rischia di trasformarsi in vera e propria crisi umanitaria. Così Barack Obama ha chiesto al Congresso quasi il doppio delle risorse aggiuntive previste, ben 3,7 miliardi di dollari, per affrontare una situazione che si fa giorno dopo giorno sempre più grave. A preoccupare è soprattutto l’ondata inarrestabile di minori non accompagnati che attraversa clandestinamente il confine: dall’inizio dell’anno 52.000. Ma senza una svolta il numero è destinato a moltiplicarsi nel giro di poche settimane. Così come quello delle donne con bambini, ben 39.000 da l’anno scorso. Per la Casa Bianca, sommersa dalle critiche per come sta gestendo la situazione, non c’e più tempo da perdere. Serve quel cambio di marcia auspicato negli ultimi giorni dal presidente che così ha inviato ai leader di Capitol Hill la richiesta di una cifra ben più consistente rispetto a quella di 2 miliardi fin qui circolata. Soldi che si andranno ad aggiungere ai fondi già esistenti e che – spiega il presidente nella sua missiva – dovranno essere utilizzati per affrontare “questa urgente situazione umanitaria”. Se autorizzati dal Congresso, tali risorse serviranno a rafforzare i controlli alla frontiera sud degli Stati Uniti, ma anche a garantire (con circa 1,8 miliardi di dollari) un’assistenza più efficace ed umana a donne e bambini. Il denaro sarà quindi distribuito tra diverse agenzie federali, compreso il Dipartimento di giustizia, quello alla sicurezza interna e quello ai servizi sanitari e sociali. In particolare, le priorità della Casa Bianca sono assumere e inviare negli stati Usa di ingresso (Texas, California, Arizona, New Mexico) più giudici per accelerare le procedure di rimpatrio (64 milioni di dollari), costruire ulteriori centri di raccolta degli immigrati e potenziare il trasporto dei clandestini rispediti nel loro Paese d’origine (1,1 miliardi di dollari), aumentare il numero di agenti che pattugliano la frontiera (433 milioni di dollari). La notizia della richiesta di più fondi al Congresso arriva alla vigilia della visita di due giorni che Obama farà in Texas, lo stato più colpito dall’emergenza, visto che attraverso la valle del Rio Grande passa la maggior parte dei disperati che arrivano non solo dal Messico, ma da tutta l’America Latina, in particolare da Guatemala, El Salvador e Honduras. Obama ufficialmente sarà a Dallas e ad Austin per una serie di incontri per raccogliere fondi per il partito democratico. E non è prevista una sua presenza al confine, salvo blitz imprevisti. Ma avrà un faccia a faccia con il governatore Rick Perry. Proprio dall’ex candidato repubblicano alla presidenza nel 2012 nelle ultime settimane sono arrivati i maggiori attacchi alla Casa Bianca: “Non gli stringerò la mano”, aveva detto Perry in un primo momento, stizzito per la richiesta di Obama di un rapido incontro in aeroporto. Ma la Casa Bianca ha poi corretto il tiro chiedendo un vero e proprio meeting. Per il presidente, che di recente era tornato a sferzare i repubblicani rei di bloccare la riforma dell’immigrazione in Congresso, è vietato sbagliare mosse. Perché – scrive qualcuno – la crisi del confine meridionale rischia di diventare per Obama quello che l’uragano Katrina fu per il suo predecessore George W.Bush. Il nuovo inquilino della Casa Bianca rilascia i primi messaggi politici al popolo americano e al mondo intero mentre per la quinta notte consecutiva non si placano le ire dei cittadini di Portland, New York, Chicago, Los Angeles, San Francisco e Las Vegas, che continuano, insistentemente a protestare per l’elezione di Donald Trump come 45° Presidente degli Stati Uniti. Ma le stesse polemiche e accese contestazioni hanno sollevato molti dubbi sulla loro motivazione. La stessa Clinton infatti ha spiegato ai suoi elettori che occorre lavorare assieme per la rinascita del Paese e dando il merito al suo antagonista di aver saputo guardare oltre, di essere stato innovativo. I dubbi sono ormai più che leciti visto che le notizie riportano come gli stessi contestatori sarebbero persone “arruolate” e pagate appositamente per protestare. A riportare la notizia il TGcom 24. Il reclutamento di persone è stato proposto dal gruppo attivista di sinistra “Washington Can!” che ha sede nella città di Seattle. L’offerta, verrebbe somministrata sotto forma di offerta di lavoro. Verrebbero offerte, infatti, 15/ 22 $ l’ora, agevolazioni mediche, oculistiche, vacanze pagate, permessi, vacanze pagate, giorni di malattia e addirittura un piano pensionistico. Il giornale “Seattle Times” ha dichiarato, che il gruppo che cerca ” Attivisti anti-Trump”, ha ricevuto minacce da tutto il paese. Sulla situazione è intervenuto il campaign manager di Trump Kellyanne Conway, invitando Obama e Clinton a far placare gli animi dei propri sostenitori, dicendo ai manifestanti che l’uomo contro cui protestano è il loro presidente. Trump lancia messaggi importanti che sembrano firmare il suo cambiamento, e sono rivolti ai suoi sostenitori e ai contestatori. Ai primi dice di fermare gli attacchi contro gay, ispanici e neri. Ai secondi dice di non protestare perché non lo conoscono, e li rassicura dicendo di non avere paura. Terminato questo monito, il Tycoon si rivolge a tutta la popolazione Americana annunciando che alla Corte costituzionale saranno nominati giudici anti aborto (pro-life) e giudici pro secondo emendamento, quello che riguarda la difesa personale anche con le armi. Trump rimane determinato riguardo il crimine e all’immigrazione irregolare. Il neo presidente conferma quanto detto in campagna elettorale e nei giorni passati, ovvero, l’espulsione o la carcerazione di circa 2-3 milioni di immigrati irregolari. Il presidente si rivolge alle persone con precedenti penali, criminali, membri di gang e trafficanti di droga. Trump, ha annunciato, che il muro tra USA e Messico si farà. Si, ma di quale muro parla? La separazione al confine tra USA e Messico esiste già e ricopre 1/3 della lunghezza totale del confine ( 3.140 km). Il muro della vergogna, chiamato cosi dai messicani, è lungo 1.000 km, si snoda sul confine tra Tijuana e San Diego, è alto dai 2 ai 4 metri ed è composto da lamiere sagomate, sensori di posizioni collegate alla polizia di confine statunitense. I lavori per il muro messicano o muro di Tijuana, iniziarono nel 1994, in una triplice proposta dell’allora presidente Bill Clinton, nel programma di sicurezza della nazione. Il muro già in parte costruito ha dimostrato che non sarebbe un valido deterrente, infatti negli ultimi anni la dogana americana ha fermato poco più di 400mila persone. La situazione, dunque pare essere nettamente mutata. Secondo i dati forniti da “Border Patrol” la polizia al confine ha arrestato un decimo delle persone che arrestavano negli anni novanta. E il confine sarà in parte muro e in parte “recinzione”, come proposto già al Congresso. Nella sua prima intervista in tv, il neo eletto presidente, ha infine annunciato di rinunciare allo stipendio da presidente:“Invece dei 400 mila euro previsti, percepirò un simbolico dollaro l’anno”. Trump nonostante si batta con ardore sui punti cardini della sua politica, sembra essere una nuova persona, più calma, più serena, ma soprattutto più disponibile al dialogo, lo dimostra la sua “approvazione” della parità tra matrimoni gay e etero e anche lo sguardo del mondo politico che accoglie questo suo percettibile cambiamento giudicandolo positivamente. A fare infuriare benpensanti e progressisti è stata l’intervista a 60 minutes della Cbs in cui il neo presidente degli Stati Uniti ha confermato il pugno duro contro gli immigrati clandestini. Ha promesso che ne caccerà due-tre milioni. E, mentre i democrat si stracciano le vesti, il professor Niels W. Franzen, direttore di “Imigration clinic” della University of South Carolina, smonta il teorena del repubblicano “brutto e cattivo”. “la presidenza Obama è stata una delle più severe in questo senso – spiega alla Stampa – con oltre 2,5 milioni di deportati dal 2009 al 2015″ . “Quello che faremo è buttare fuori dal Paese o incarcerare le persone che sono criminali o hanno precedenti criminali, membri di gang, trafficanti di droga” . Il provvedimento, annunciato in campagna elettorale e confgermato ieri sera ai microfoni della Cbs, colpirà “due o tre milioni” di immigrati che risiedono clandestinamente negli Stati Uniti, ma non sarà la sola misura che verrà adottata da Trump. Verrà poi rafforzata la barriera anti immigrati, che divide gli Stati Uniti dal Messico, con alcune parti in muratura e altre in recinzione. “In alcune aree il muro è più appropriato – spiega il neo inquilino della Casa Bianca – sono molto bravo in questo, vale a dire nelle costruzioni, ci possono essere alcune recinzioni” . I progressisti hanno subito storto il naso. Peccato che in tema di immigrazione non dicano come le cose stanno veramente. Innanzitutto il muro tra gli Stati Uniti e il Messico non è stato costruito dai repubblicani, ma da Bill Clinton nel 1994. In secondo luogo, nemmeno Obama premio Nobel per la Pace è mai stato tanto tenero con i clandestini. “Gli Stati Uniti – spiega Franzen sulla Stampa – attualmente deportano tra i 300 e i 400mila clandestini ogni anno, la presidenza Obama è stata una delle più severe in questo senso con oltre 2,5 milioni di deportati dal 2009 al 2015. Al netto di coloro che sono stati fermati al confine. Quindi i meccanismi sono già oliati da un punto di vista tecnico” . Negli Stati Uniti non tutti hanno digerito a cuor leggero la vittoria del candidato repubblicanoDonald Trump, eletto, grazie ad una vittoria netta sulla rivale democratica Hillary Clinton, 45° Presidente della storia del Paese contro ogni pronostico e previsione. Migliaia di persone sono scese in piazza in molte grandi città per protestare contro la vittoria del “tycoon” al grido di “non è il mio presidente”, da New York a Washington D.C passando per Seattle e Oakland. Manifestazioni non sempre pacifiche, dove si sono registrati almeno un centinaio di arresti tra i manifestanti. A New York la polizia ha arrestato trenta persone che manifestavano davanti alla Trump Tower. Lo stesso è accaduto a Los Angeles, a Chicago, e in tutto il resto del Paese. Che una parte di queste manifestazioni sia spontanea, nessuno lo vuole mettere in discussione. Ma se si analizzano a fondo questi moti di protesta contro il neo-presidente c’è anche dell’altro che merita di essere raccontato: ossia che un’altra fetta di queste proteste è de facto fomentata e finanziata ad arte da alcune associazioni molto potenti e influenti che fanno parte degli ambienti “radical” e progressisti americani. Organizzazioni che hanno dalla loro parte un’ingente quantità di denaro da offrire a nuovi adepti e attivisti dell’ultimo minuto, tanto da pagarli fior di quattrini per farli scendere in strada ad esprimere pubblicamente il proprio dissenso contro The Donald. Come? È davvero molto semplice. Facendo una banale ricerca su Craigslist, database molto popolare negli Stati Uniti che ospita annunci dedicati al lavoro, eventi, acquisti, incontri e quant’altro, si possono facilmente scovare delle curiose comunicazioni come questa: siamo a Seattle, nello Stato di Washington, una delle città teatro delle manifestazioni anti-Trump. L’annuncio è stato pubblicato nelle stesse ore – guarda caso – in cui tali dimostrazioni si sono succedute. “Combatti l’Agenda Trump! – recita l’annuncio – Assumiamo attivisti a tempo pieno. Washington Can! È la più radicata associazione politica no-profit del nostro stato. Da oltre 35 anni ci battiamo a livello locale e nazionale su tematiche quali le questioni razziali, il sociale, la sanità, i diritti degli immigrati, l’equità fiscale. Siamo alla ricerca di persone motivate, che sia per un part-time o a tempo pieno. Offriamo dei posti fissi e abbiamo diverse posizioni di lavoro. Offriamo assistenza medica, ferie pagate, giorni di malattia retribuiti, aspettativa. Viaggi. La paga media varia tra i 15 e i 20 dollari l’ora“. L’annuncio sospetto è stato pubblicato dalla Washington CAN! – acronimo diWashington Community Action Network – associazione vicina alla sinistra “radical” che conta più di 40mila iscritti e la cui mission è quella di “raggiungere l’uguaglianza economica, sociale e razziale al fine di stabilire una società democratica caratterizzata dalla giustizia ed equità, nel rispetto delle diversità e da una qualità di vita decente per tutti coloro che risiedono nello Stato di Washington”. La Washington CAN! fa parte di un network di associazioni presenti in modo capillare su tutto il territorio degli Stati Uniti e affiliate sotto il nome di USAction, federazione composta da 501 organizzazioni e gruppi di matrice progressista fondata nel 1999 e ora presieduta dall’attivista afroamericano William McNary. Vicepresidente è Heather Booth, volto storico del femminismo statunitense. 20/10/2016 Piero Iannelli Commenti disabilitati su Aborto alla nascita? La Clinton, agghiacciante, dice sì . Sapevate che negli USA ci sono più di 800 campi di concentramento?